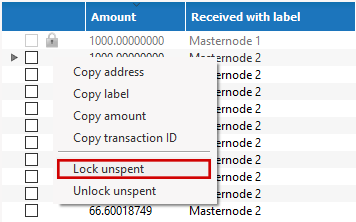 Right click on the transaction(s) you do not want to spend, then select Lock unspent. A small lock will appear next to the transaction. You can click the Toggle lock state button to invert the locked/unlocked state of all UTXOs. When you are ready to continue, click OK. You can now safely create transactions with your remaining funds without affecting the locked UTXOs. Since version 0.12.2.0, Axe Core has included an implementation of BIP39/BIP44 compatible hierarchical deterministic (HD) key generation. This functionality is only available from the command line by specifying the usehd option when starting Axe Core for the first time. Use this function with care, since the mnemonic seed and keys will be stored in plain text until you specify a wallet passphrase. Note that the wallet passphrase is different to the mnemonic passphrase, which is often also referred to as the “25th word” or “extension word”. The wallet passphrase encrypts the wallet file itself, while the mnemonic passphrase is used to specify different derivation branches from the same mnemonic seed. axe-qt.exe --usehd=1 --mnemonic="enter mnemonic" --mnemonicpassphrase="optional mnemonic passphrase"
The HD wallet will be restored and your balance will appear once sync is complete. The createmultisig command takes as variables the number n signatures of m keys (supplied as json array) required. In this example, 2 of 3 keys are required to sign the transaction. Note: The address can be created by anyone, as long as the public keys and their sequence are known (resulting address and redeemScript are identical, see below). This works the same as a usual transaction. The seller/arbiter can trace the transaction by its txid in the block explorer. Or from the console as follows. Now we assume the deal is complete, the buyer got the goods and everyone is happy. Now the seller wants to get his Axe. As a 2-of-3 multisig was used, the transaction must be signed by 2 parties (seller + buyer or arbiter). The seller creates a transaction (we will reuse his public address from above). Note that the output hex is getting longer, but complete flag is “false” as the transaction needs another signature. So now either the buyer or the arbiter can complete the signature of the transaction, using the output from above and their private key. Let’s assume the buyer is completing the signature. The signature is complete now, and either of the parties can transmit the transaction to the network. 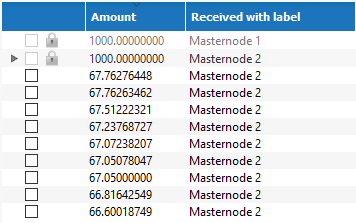 Again, this transaction can be traced in a block explorer. And the seller is happy to receive his coins at his public address as follows. It is possible to select between different Axe wallets when starting Axe Core by specifying the wallet argument, or even run multiple instances of Axe Core simultaneously by specifying separate data directories using the datadir argument. To begin, install the Axe Core wallet for your system according to the installation instructions. When you get to the step Running Axe Core for the first time, you can decide whether you want to maintain separate wallet.dat files in the default location (simpler if you do not need to run the wallets simultaneously), or specify entirely separate data directories such as e.g. C:\Axe1 (simpler if you do want to run the wallets simultaneously). 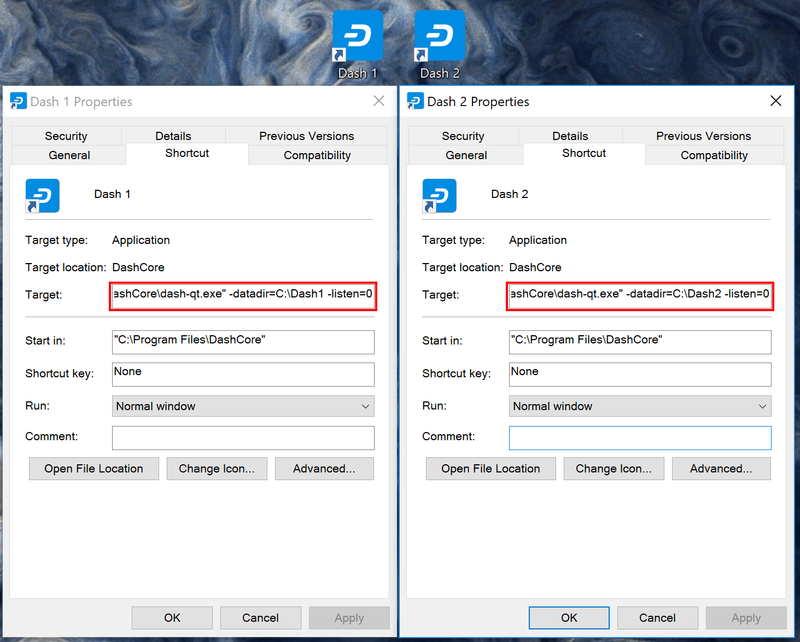 For this scenario, we will create two shortcuts on the desktop, each using a different wallet file. 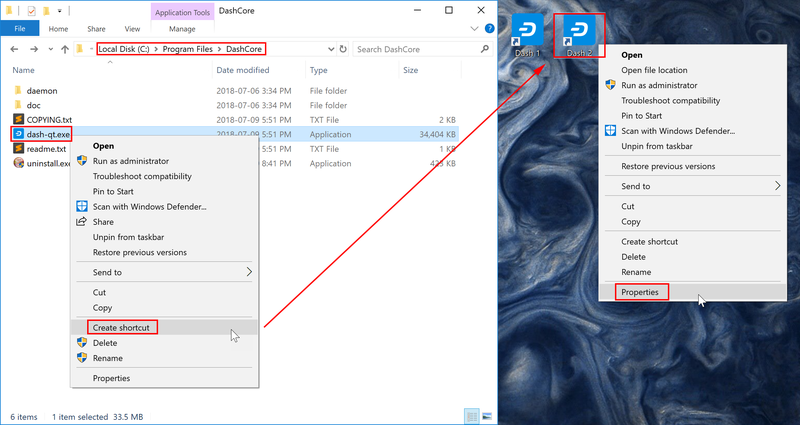 Navigate to the binary file used to start Axe Core (typically locatd at C:\Program Files\AxeCore\axe-qt.exe or similar) and create two shortcuts on the desktop. Then open the Properties window for each of these shortcuts. You can now use the two icons to quickly and easily open different wallets from your desktop. Note that you cannot open both wallets simultaneously. To do this, you will need two separate data directories, as described below. 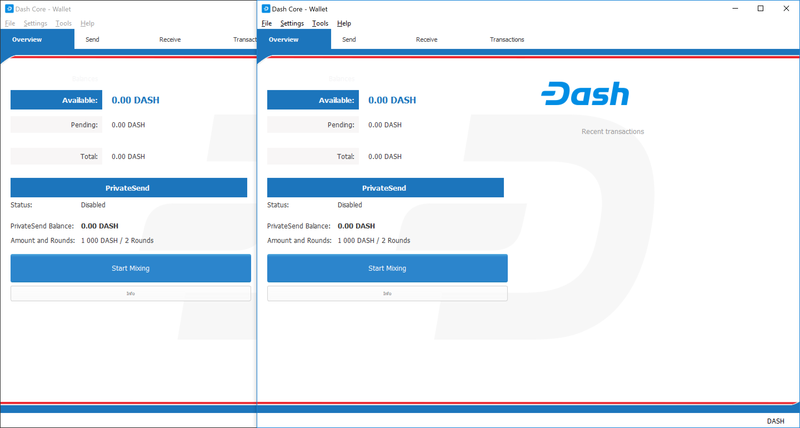 You can now use the two icons to quickly and easily open different wallets simultaneously from your desktop. Both wallets maintain separate and full copies of the blockchain, which may use a lot of drive space. For more efficient use of drive space, consider using an SPV or “light” wallet such as Axe Electrum to maintain multiple separate wallets without keeping a full copy of the blockchain. Since version 0.11.0, Axe Core has supported integration with KeePass, the popular open source password manager. This guide describes how to configure the association between Axe Core and KeePass, and how to save a Axe Core wallet passphrase in KeePass using the integration. When this is done, KeePass can be used to unlock the wallet. Generates a base64 encoded 256 bit AES key that can be used for communication with KeePassHttp. This is only necessary for manual configuration. Use init for automatic configuration. Sets up the association between Axe and KeePass by generating an AES key and sending an association message to KeePassHttp. This will trigger KeePass to ask for an ID for the association. Returns the association and the base64 encoded string for the AES key. Updates the passphrase in KeePassHttp to a new value. This should match the passphrase you intend to use for the wallet. 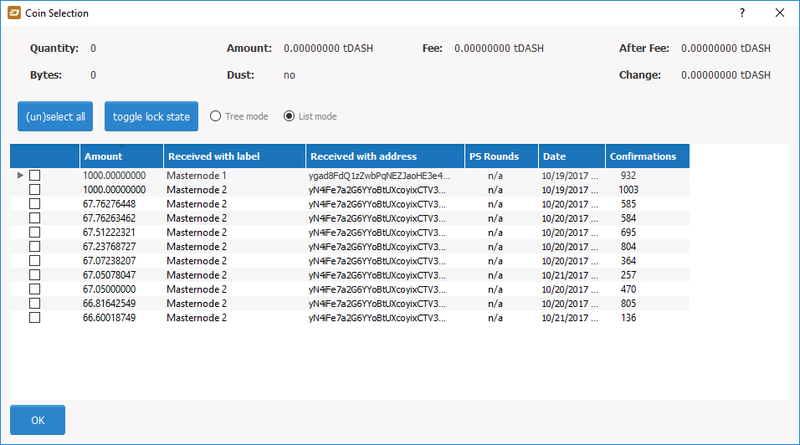 Please note that the standard RPC commands walletpassphrasechange and the wallet encryption from the QT GUI already send the updates to KeePassHttp, so this is only necessary for manual manipulation of the password.